Are you, like me, one of those people who like to keep a little bit of Christmas up throughout the year? I love to keep my collection of Santa's in my cabinet so I can enjoy them year round. 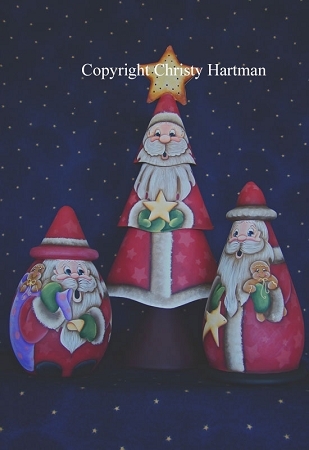 These Santa's are so happy and charming that you will hate putting them away at the end of the holiday season. The taller tin Santa is painted on the 13" Rusty Tin Tree available from Painter's Paradise. It would be possible to adapt this pattern to other 3 dimensional surfaces with a little creativity. 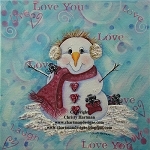 I've included 6 photos with this pattern. Enjoy. You are purchasing an E-Pattern and once payment has been received you will receive an email with instructions to download the pattern.